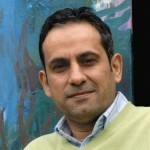 has lived and worked in Denmark since 2001. 1985 – 92: Studies at the College of Fine Art, Baghdad University. 2013 – 15: MFA-National College of Art & Design – Dublin, Ireland. From 1993 exhibitions in several countries in the Middle east and Europe.